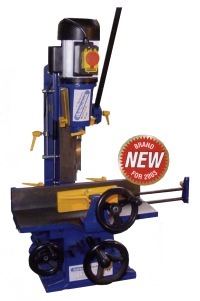 This industrial class machine is capable of a 1" mortace in softwood and with an extended timber capacity of 8" is large enough for any workshop. cast iron construction with a gas spring to support the weight of the head, top and bottom chisel depth stops and a multi-position handle for speed when working with small timber. 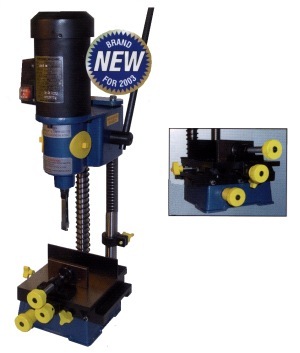 Repeat stops are fitted to the table movement along with a timber position stop, which means this machine is ideally suited to a production environment. All of the dovetail slides have an ajustable jib strip to allow for any wear during the life of this machine, which will undoubtedly be long. Supplied with 4 Chisel brushes for using both forign 3/4" and 1.1/8" or British 13/16" chisels, NVR switch, screw thread work clamp, 1/2" chisel, cable and plug. NEW for 2003 a bench top morticer with a sliding table system. This unique all metal construction allows timber of up to 100mm x 100mm to be clamped securely. There are then two controls to move the table from left to right for wide mortices and from front to backfor deeper mortaces, which gives more accurate cut and is easier to use than a fixed bed machine. Supplied with, mortace depth stop, chuck key holder, work clamp, adjustable back fence, 1/4", 3/8" and 1/2" chisels, drilling conversion kit, cable and plug. D.B. Keighley Machinery Ltd, Vickers place, Stanningley, Leeds, LS28 6LZ.